Cambridge Tennis Club now uses the Book A Court system for all court bookings. This includes both members and the general public. All court booking use (by members and public) is subject to the rules of Cambridge Tennis Club. These can be found on the membership page. If a court is available, details will be shown. Click BOOK NOW. Alternatively, click VIEW SCHEDULE to choose a date/time/court to play. You will be asked to sign into the Book A Court website to complete your booking. You will be asked to confirm your booking and pay if required. Once booked, you will receive an email and/or SMS with your gate access PIN. This will be a 4 digit number. Please be aware if takes up to 15 minutes for this PIN to be registered at the gate. 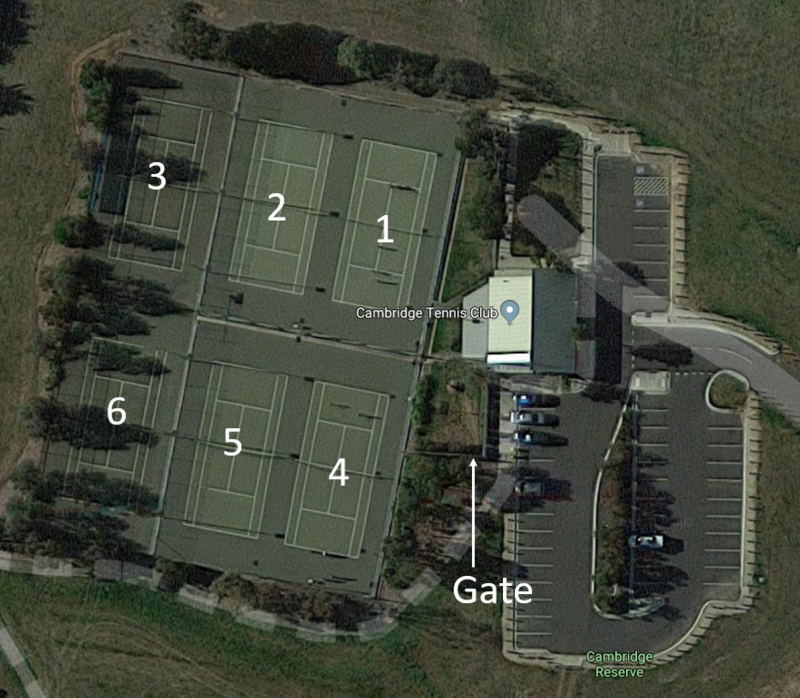 Once at the tennis club, enter your PIN followed by the ENTER symbol at the keypad. The gate will unlock and turn green. Close the gate behind you. Once done, leave through the gate and ensure it is closed behind you. Your access PIN code should start working 5 minutes before your booking is due to begin. Each PIN is assigned to a specific person and only valid for when that person books a court. DO NOT share your PIN with anyone. Please ensure you are only using the court that you have booked. If someone else has booked a court you are using, you MUST vacate it. Court bookings only provide access to the tennis courts, not the clubrooms. Kitchen and toilet facilities are not available for use with court bookings. While we will try not to, there may be times where we need to cancel a booking. In the event of this, all payment will be refunded. Court lights are automatically managed through the Book A Court system. There is a ambient light sensor that will turn the lights on or off automatically depending on how bright it is outside. Court prices have been set to reflect this. Courts without lights are not bookable/usable after a certain time due to safety concerns. Light tokens are no longer available for purchase or use. As lights now turn on automatically, court hire fees are now based on time, reflecting when lights generally turn on and off. Costs may also vary per court. All costs will be indicated to you during the booking process. All court booking fees are used by Cambridge Tennis Club to help manage and maintain the facility. Members experience several benefits over non-members with the Book A Court system. Membership in the system needs to be updated by Cambridge. This may take several days once a member has joined the club. If you believe you are a member but do not experience the above benefits, check if your account is using the email address you provided Cambridge Tennis Club with when joining as a member. Please contact us if unsure. If you'd like to join as a member, please see our Membership page. If your code does not work at the gate, please ensure you have waited for at least 15 minutes before contacting anyone. The gate is only made aware of new bookings every 15 minutes. If you experience any issues with the system, text (preferred) or call 0427 084 596. Please understand that while we will try and assist you as soon as we can, the committee is made up of people who are busy. While we will do our best to get back to you, your issue may not be solved straight away. Courts 1, 2, 4, 5 all have lights. Courts 3 and 6 do not have lights.